It's a love fest between us and Vilnius! This is our third time here. We love the vaulted primrose colored Philharmonic Hall which holds about 700 and is a perfect place for us to sing. The audience was highly enthusiastic before we even opened our mouths, and that just carried on throughout the performance. 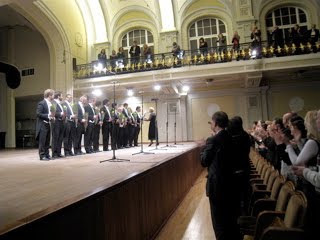 The U.S. Embassy had supported the concert. The CD tables, as before on our previous two visits, were wildly active. We even added on extra hands (Brian volunteered,) but the second half of the program still had to start late because we couldn't stop the sales.